i'm blaming it on the cold weather, dark mornings and ever-darkening afternoons. i'm sure that's why a little snacky-poo mid afternoon has become less of an option, and more of a convention. our printer has chosen to start buying those choc mini rolls (mmmm) and latterly, treacle scones in an effort to stave off our collective hunger pangs. examined rather more closely, these hunger pangs are likely somewhat on the ephemeral side; they might well be real, but is the best way of satisfying them to stuff one's face with mini rolls (mmmmm) and scones? let us, for the sake of hypotheticalness, suppose that i am in early season training mode, that i have noted my resting heart rate, figured out how many hill reps i need to do in the front driveway and limbered up by pumping both tyres to 100psi (6.8 bar). all i really need to seal the deal is something to train for. of course, a honed athlete does not live by bread alone; there's those nutritional factors to take into account, and despite combing the chapters of chris carmichael's food for fitness, i can find no reference to choc mini rolls and treacle scones. in fact, despite my knowing that a mars bar would help me work, rest and play, chris seems to have completely overlooked this well known dietary advice. actually, whether you take all this training stuff seriously or not, if you just want to be able to ride your bike with grace, aplomb, and no stomach resting on the top tube, it is a good idea to take at least some account of what passes for food on your table, or next to the laser printer of an afternoon. however, this is the generation of instant gratification, of indexed gears and clipless pedals; that's why, when you stroll past the mini roll counter, it's not too much of a stretch to reach for a convenient pack of four treacle scones or, even worse, danish pastries. there is, of course, a perfectly formed solution to this problem which fits neatly into the instant gratification folder, and will keep those mid-afternoon (or even mid-morning if breakfast wasn't all it's cracked up to be) hunger pangs at bay. and it comes in a box. 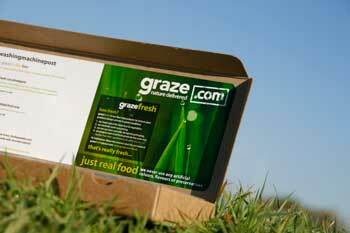 graze.com was started by a group of seven like-minded folks who realised that like-minded included a few more than just them. looking at the card box that arrived through my letterbox, i think i must include myself, and can think of one or two others who'd like one of these too. the contents are all natural: there's a container filled with dried pineapple, pecan and raisin, a pumpkin seed mix, a tray of pitted olives and a small tray of walnuts. included in the recycled box is a sheet of recycled paper detailing all the carbs, fat and protein pertaining to each sealed container which, if you are following a micro detailed training regime, makes adding up the numbers a whole lot easier than a mini roll wrapper. oh, and a recycled napkin. the happy part is that this is all orderable over the interweb for a mere £2.99 including delivery. you'd have to have a very restricted diet not to find something in the extensive list of options to fill your box of natural goodies, which includes fresh fruit. now, i know what you're thinking; why don't i just take a pop to the supermarket or health food store and do it for myself. but ask yourself this: do you currently bother to make up a couple of sandwiches the night before. i've had great intentions of doing so for many a long year; i used to make myself a pasta dish every morning for lunch, but that habit unfortunately didn't endure, and it's now a case of grabbing what i can, when buying my daily paper. i can assure you that it doesn't have the attraction of the little box that sits before me now. 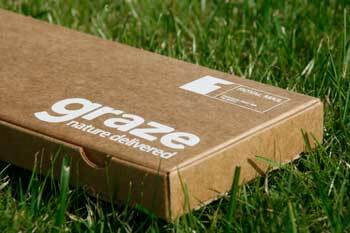 should you be suitably intrigued, and you should be, graze are currently being kind enough to let you have your first box at half price. ordering is a simple process, and you can have them delivered regularly on the same days each week, or vary it at your leisure. this means that, as the sportive season kicks in later in the year, you and i will be the svelte, fit, healthy front runners, calmly chatting nineteen to the dozen on the front of the climbs. either way, snack time will never be the same again.